In the previous post, an example of using STM32 DMA to perform a simple data copy between 2 arrays was introduced. Now, I will show another example with DMA and I2C to read raw data from MPU6050 acceleration and gyroscope sensor directly. Besides, a comparison to show timing difference between using and not using DMA is also mentioned. MPU6050 is a very popular MEMS acceleration and gyroscope sensor and other devices can connect and get data from it through I2C connection. There are a lot of libraries for Arduino that are available on the internet for connecting with MPU6050 and few libraries for STM32. Harinadha has done the porting job from MPU6050 Arduino library of Jeff Rowberg to STM32 here as well: http://harinadha.wordpress.com/2012/05/23/mpu6050lib/ without using INT pin (interrupt pin) of MPU6050. I also used this library at the first time and found it was quite difficult to get the most updated gyro data for calculation. So, I got the wrong gyro angle all the time. Moreover, I noticed that the code took lots of time to read 14 bytes of data (including 6 bytes acceleration, 2 bytes of temperature and 6 bytes of gyro), nearly 2ms, so there is no chance to get the sample rate at 1ms. MPU6050_Write(MPU6050_DEFAULT_ADDRESS, MPU6050_RA_INT_ENABLE, 1<<0);        //interupt occurs when data is ready. The interupt routine is in the receiver.c file. Gyro full scale for X, Y and Z axis : +- 2000 degree/second. This means for example if the sensor is rotated in X axis with maximum angular velocity of 2000 degrees per second, the gyro X data will be maximum value of 16bit integer variable: 32768. In the other hand, the readout value will be -32768 if the angular velocity is -2000 degrees per second. From here, we can come out with the conversion ratio from raw sensor data to real angular velocity: r = 32768 / full scale value = 32768 / 2000 = 16.384. Accelerometer full scale: +- 16g. Fire interrupt signal when data is available. Clear interrupt flag whenever the data is completely read out. As you can see from the two tables from STM32F1 reference manual, there are 2 DMA blocks connected to different type of peripherals using different channels. Here we connect MPU6050 with I2C1 of STM32, so that the only choice is DMA1. Then, for reading data, we need to consider channel 7 that is connected to the RX register of I2C1 where all incoming data is stores. Later, if you want to use other peripherals with DMA in your own project, this table can be useful. 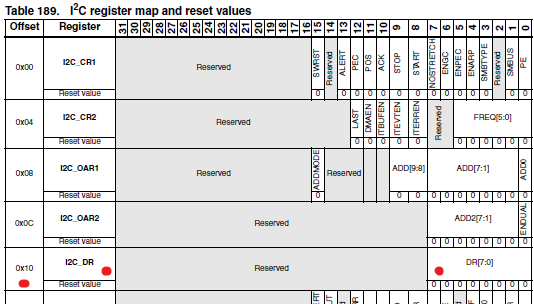 Each peripheral inside the STM32 has a boundary address which can be found in Table 3 of the reference manual. And inside that peripheral, there are several registers whose address are inside that peripheral boundary. For example, in our case, we need to locate the address of I2C_DR register (Data register) to assign to DMA controller. As mentioned before, 14 bytes will be read from MPU6050, so DMA_Buffersize here should be 14 bytes. Prepare_Gyro_Data();    //Read out the accel and gyro data whenever interrupt occurs. // When the data transmission is complete, it will automatically jump to DMA interrupt routine to finish the rest. Now, the reading sequence will be done automatically and store into AccelGyro variable with the minimum time needed. I have also done a timing test to check how efficient this method could be. Following figures show the timing consume of two method: regular reading and DMA reading. Channel 3 in both figures shows the timing period when CPU is dealing with I2C reading. With the normal way of reading I2C data, CPU is busy for the whole period and cannot do anything else. This could lead to delay in reading other sensor data as well. By using DMA, we can free the CPU to do other task as DMA handles all the reading part from I2C peripheral.